I’ve got a HUGE kit for you this month. The palette was awesome for the original mid-century modern theme that it was suggested for, but it makes a fantastically cheerful December holiday palette. I’ve created some mid-century papers, in a nod to its original intended use, but most of the ladies have created traditional holiday-centric elements. Marisa and Erin Crouch are two that I know have done some mid-century parts. That’s not to say any of the others’ kits are bad; on the contrary, I think this is one of our best trains of the last year. So here’s the palette that was chosen for this month’s kit. As usual, I’ve linked it to the main blog train thread at PixelScrapper. I’ve got a round 2 dozen papers for you this month. The first batch is the mid-century papers, which I’ve tried to make usable year-round rather than just at the holidays. The second is a set of more traditional holiday papers in a mix of styles, so there should be something here for everyone. I’ve also included a couple of papers for those of you who celebrate Hanukkah/Chanukah or Kwanzaa, as that’s something I rarely see anyone create even a single item for. As I’m visibly neither of Jewish nor African ancestry, I know that some people might consider it cultural appropriation that I should presume to design something for a culture I’m not part of, but it was either that or exclude you by omission, and I believe that everyone should have something that reflects their own celebration. If you can find Hanukkah or Kwanzaa-specific scrapbooking elements elsewhere, congratulations; if not, there’s at least something here to get you started. The snowflakes and snowflake frames are new, drawn specifically for this kit, though I have a couple of packs of them in the shop here as well if you’d like more of them. They’re CU, and the frames come with clipping masks. I’ve just posted a kit of extracted winter foliage in the shop, too, and they’re CU as well, but in their original colors so they can be used as elements. Don’t forget to check the release post for them; there’s a freebie wreath made with the elements just waiting for you to download it, too! Personally, it’s been a long month–my doctor says part of the issue with me being tired all the time is a REM-dependent sleep apnea, and he wants me to get a CPAP machine/mask to wear at night. Unfortunately, my oxygen saturation doesn’t drop enough (when averaged through the entire night) for insurance to approve paying for one, even though it does drop enough during apnea events, so I’m either going to have to go without, appeal for them to cover it, or find a way to come up with $800. Stupid bureaucratic red tape. But that explains why I’ve spent the last 6-8 months being so tired that I have to go back to bed when I just got up 3-4 hours ago–I apparently stop breathing about 5 minutes after I hit REM sleep. *sigh* Hopefully I’ll be able to sort the red tape out and get a decent night’s sleep for Christmas. It’s pretty sad when that’s the top of my Christmas list this year, even higher than more RAM, a new hard drive, or a trip to London to spend New Year’s with my sweetie. At least this year is almost over; hopefully next year will be better and I’ll be able to make some progress toward the long-term goal of living in England with him. I know I’ll make progress on my designing skills; I’m constantly trying to learn more! Thanksgiving, at least, was good; my turkey turned out reasonably moist, and the gravy was flavorful and had no lumps. My stuffing tasted like Mom’s; giblets, onions, celery, sage, raisins, and chopped apple in her recipe make it hard to find anything close elsewhere. The cranberry relish is fantastic–I made a big batch so I could freeze some since cranberries aren’t a year-round thing in stores here. The leftover roasted sweet potatoes got used up in mom’s sweet potato-apple bake (sliced 1/4″ thick, layered on edge in a 9×13 pan with thin apple wedges, sprinkled with cinnamon, and baked at 350F until the apples are done–marshmallow scatter during last 5 minutes optional). My pie crust turned out flaky and didn’t get too brown and the pumpkin filling had that extra little something that I get from swapping the cinnamon and cloves for garam masala. It would have been an even better meal if I could have spent it with family, but that just means lots of frozen meals ready for when a flareup hits. Anyway, that’s all I’ve got for you on this blog train (only a lot! ), so I’m sure you’re ready for a few download links. And when you’re all done here, head on back to the main blog train thread at PixelScrapper to pick up all the wonderful portions made by the other designers. 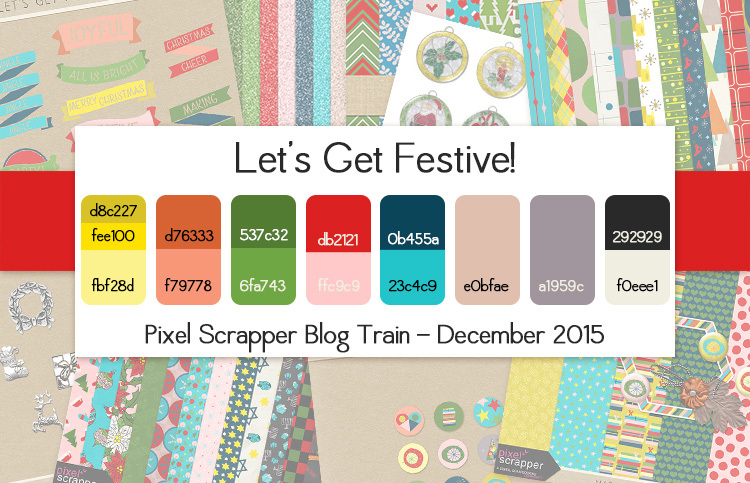 There are lots of gorgeous previews this month, and I’ll be traveling the train right along with you, because I scrap Christmas too! You may want to check with medical supply to see if you can just rent a cpap machine and your insurance might cover than option over buying one. Thanks for you lovely large Christmas contribution to this blog train. It might be an option; I’ll give them a call and see what the costs would be, and if they can get Medicare to cover that as a trial of therapy. It might be that once it’s been in my home and helping for a while, it can show them more about how little sleep I’m getting without it. Hi! Such a great kit, but I just can’t find any links for download… can you help me? I just found your comment 20 minutes ago, and replaced the links before contacting my ISP. Apparently they had to restore a drive from backup last night, and the backup they restored to was done while I was writing my post, before I’d added the links. Occasionally, even when I get it right, technology still trips up, I guess. Thanks for letting me know. Hi! I love your blog train previews. Where is the kit available? None of them seem to be linked. Thanks! I’ve replaced the links; apparently there was a need for the ISP to restore my site from backup, and the one they used was taken while I was in the middle of writing the post, before my download links were added! It’s sorted out now, and I hope you’ll be back to download. So, I’m not sure how to download these things. I click on things but only enlarge the previews. word art link is saying not found…. Fixed, thanks for letting me know. That’s what I get for trying to fix it in a hurry after drafting the post over a couple of days–this is why they tell you that working tired is a bad idea! Hi! I am in LOVE with your wordart!! Unfortunately, that link isn’t working for me. The others are, but that one is saying it isn’t valid. Link repaired, go ahead and download it! Thank you so much, love your part! Could you check the Word Art link as it says not found, please. Thank you so much again! I’ve checked it and updated the incorrect hyphens to be correct. Hi! Absolutely love this kit! Thank you so much! Just wanted to let you know that the link for the word art download doesn’t work. It keeps going to another page stating that it is an out of date link or a mistyped address. But the word art looks like they will be fantastic! Thanks again! I also hope you start getting some rest so you will feel better. Good luck with getting the CPAP machine. Anyway, they’re fixed now; feel free to download. Hi Holly. Your word art was definitely worth the wait! The whole kit is wonderful! I could not even begin to do what you do (even back when I was healthy, lol). I know what you mean about exhaustion and having to take naps. Even after I get my naps in, my hands still have “fumble fingers” and when I look to see what I typed – it’s all gibberish. So please don’t worry about a couple of snags. We all love the work that you do and really appreciate it. My son-in-law has sleep apnea and he would fall asleep driving home from work. He finally got his CPAP machine and the insurance hardly paid anything on it. As of last month they still owed over 800 on it. Luckily the company they got it from is working with them so they are able to make monthly payments on it. He is finally starting to feel better and no longer is falling asleep at dangerous times. I sure hope that you can find a company like they did that will work with you so that you can find relief too and start to feel better. The link for the word art does not work. Your kit is beauitful. There is so much in it, I don’t have to follow the train, but I will. Hope all goes well with your health. The word art link is repaired now; my apologies for not noticing I’d used underscores in the name on that one instead of hyphens. I’m going to blame it on trying to get the links back up in a hurry and the exhaustion making me space out double-checking the re-added links. But explanations aren’t justifications; I should have remembered. Thank you very much for this fabulous kit. Hopefully you’ll find a way to get the cpap machine soon. No link for word art and Thanks so much!! Hi Holly – Thanks for resetting the links (I was beginning to think I’d lost my mind because I knew they should be here but I couldn’t find them)! I’ve been able to download the papers & elements but the link to the word art takes me here http://hollywolfscraps.com/BlogTrainKits/PSDec2015-HWolf-WordArt_CU.zip & says “Not Found”. Thank you so much for all the gloriously lovely kits!! The hyphens should all be underscores; I’ve corrected it now. I’m sorry. Thank you so much, Holly. I really appreciate all the work you put into this, both the lovely designs & all the blog post fixing you’ve had to do (plus all the notes to all of us). Thank you for the great kit and it’s greatly appreciative that you were kind enough to add in Hanukkah. Always nice to see that for us who celebrate it. Happy holidays. Thank you–I hoped someone would appreciate the addition, though it’s admittedly small–barely a mini kit. Since I don’t celebrate it, I don’t know much for symbolism other than extreme basics, but I tried to include at least something that can go with the winter-themed elements to make a couple of pages. Thanks for this great kit!! I’m sorry you’re dealing with these sleep issues… I hope you get a favorable response soon! Thank you so much for your very generous gifts! 🙂 Merry Christmas! Thanks, Holly, for all the Christmas goodies. Your drawings are delightful. Thanks too for the Extraction tut. I’ve never worked with vectors or the pen tool and I am excited to learn a new technique. It’s certainly made my extractions so much better, Cesc. And with them being clipped to a shape, I have zero worries about stray pixels or jaggies, which was always the part that gave me issues whenever I used other extraction methods. Holly – love the HUGE kit you created – thanks so much for it. Thanks so much for including non-Christmas items, such as the wonderful word arts! Just one small comment – a menorah has a total of nine candles; yours has seven. Oops! That would be the problem with designing things for holidays I don’t properly know about. I can draw one up with nine and have it available for download tomorrow. Done. And you can download it HERE. Just right-click and save as; it’s labeled like all my other elements, and saved as PNG, ready to use. I discovered that the 7-branched one I drew is actually for Shabbat, so at least it’s useful. love your backgrounds and will be happy to use them first chance i get. Gorgeous!! The whole thing… Kit and word art is just gorgeous!!! Thank you so much for sharing!!! Oh my goodness!!! What a full and awesome kit! I especially love your papers. Thanks so much! Thank you — what an amazing collection! I especially love all that gorgeous word art! Thank you for all your hard work Holly! Love the cookie cutters. Thanks so much for this; it’s truly wonderful! Keep up the great work, Holly! Wow, thank you for all this beauty! so many wonderful things, thank you for making and sharing! Big thanks! and I also really hope that you will get help soon health-wise and get a solution for that cost, that you will get it covered. I am happy about living in Sweden where I would be able to borrow this without cost as long as I needed it. Well all countries and communitys has its good things and less good things in different ways. But I hope really hope you get help with what you need, without that huge cost! Hi Holly, Thank you so much for such a huge lot of word art. I love the illustrated quality of the elements. I have many christian friends, but we all celebrate Christmas in India irrespective of faith, with cards and cake and church choir etc. Will make some cards for my friends with these kits. Thank you. Hope your sleep condition, gets better. Merry Christmas in advance. Hats off to you, that you work so hard on making these kits… Sending you loads of love and hugs and all the best wishes for you. Your blog entries are always very interesting to read. The last bit about pumpkin pie and turkey and I was gulping saliva… ha ha ha… I only know about garam masala & roasted sweet potato… the rest of sound so exotic. I had fun a few years ago with my Thanksgiving meal and put an Indian twist on all the classic American traditional dishes, which is definitely an exotic approach over here. It was a fun way for me to learn a few new recipes! My turkey got rubbed with a tandoori masala-yogurt paste and stuffed with a mix of basmati rice, lentils, onion, raisins, and cashews. The squash was braised with fenugreek and jaggery instead of being roasted with cinnamon and brown sugar. My green beans, instead of garlic and butter or mushroom soup, used a traditional masaledar sem recipe (ginger-garlic paste with cumin seeds). The appetizers were samosas; yeast-based bread rolls were substituted with naan. Pumpkin pie usually has cinnamon and clove in addition to the ginger, but the addition of the coriander and black pepper in garam masala gave it that extra nuance that the regular recipe sometimes lacks. I still did mom’s cranberry-orange relish rather than opting for a cranberry chutney as the people I was serving it to aren’t fond of chilli-type spices, but that was the only semi-traditional dish on the table. I’m glad you all celebrate Christmas there; it’s rather depressing how many people don’t over here, or make their only celebration the gift exchange with a tree in the background. I hope your cards turn out beautifully and that you have a wonderful Christmas. Thank you so much for these beautiful and colorful kits! I love them! Thanks for an amazing kit! I LOVE that you included Hannukah items, they are so hard to find. Thank you for sharing such beautiful kits with us. Thank you so much for sharing your beautiful art! Merry Christmas! Thank you for another amazing kit, Holly! You put so much effort into these, and I’m always amazed at what you come up with, as well as your generosity! The word art is so pretty, and everything is so bright and colourful! I wouldn’t worry about seeming presumptuous for designing Hanukkah elements, etc. You’re right that they’re hard to find, and I have friends who are Jewish that I scrap for and have a hard time finding different Hanukkah items. Also, being Canadian, I am always absolutely delighted and happy when designers include some Canada Day stuff in with their 4th of July designs, so I’m sure people will be happy you included them! Thank you again! Beautiful word art, but when I started to download it, my anti-virus software blocked it, saying it contained a possible virus or spyware. You might want to check with your ISP provider to find out if your account was compromised when they restored after crashing. My college major was computer science, so I’m much more security-minded than a lot of designers, and checking this was an immediate priority when I read your comment. While I run virus scans every 3rd day and avoid visiting/downloading from sketchy sites, I downloaded the word art ZIP that’s on this site and double-checked it with my own local Avast! install. Then I also used the online scanners at VirusTotal and Jotti to verify that it’s clean. Those two sites will take a file upload or a URL and scan it with 20-50 antivirus/anti-malware programs, and were recommended to me by a anti-malware security specialist friend. VirusTotal’s scanner shows 0 of 55 programs reporting a positive scan, as well, but they don’t offer a link I can copy/paste to show you. Still, the scanners in the Jotti list make up 95% of the antivirus market, so any Internet security professional would suggest that, with all those reporting it clean, the odds of it being infected are down in the one-in-500,000 range. I was really happy with all of the word art, too, Susie. Thanks! Unfortunately, I’ve already gone back to the doctor’s office and they’ve tried to get Medicare to cover it, but since the computer system for Medicare won’t even let the medical equipment places file a claim for this because my overall AHI isn’t high enough (despite the REM AHI being high enough), I can’t appeal since there’s no denied claim to appeal. The doctor’s office has tried everything they can think of, as well. I’ve been through both crying and screaming in frustration at the ridiculous hassle of trying to get some claims processor, who will likely never meet me, to stop believing that they know what’s better for me than the specialist lung doctor who’s been seeing me for a year now. In the meantime, I’m lucky if I feel like I slept 4 hours when I get out of bed after 10 hours of “sleep”–and some mornings it’s 1 hour’s restorative sleep for 14 hours in bed. I’m seriously thinking about maybe turning to someplace like the Salvation Army or even crowdfunding to try to get the initial kit so that I can start getting some real sleep again, because I hate the whole being too exhausted to get anything physical done, and too snappish from lack of sleep to be able to talk to anyone in person for long. Thank you so much and Merry Christmas. That wreath is beautiful, Holly… Stuff you extracted looks pretty, too. Tyvm for the wreath. And thank you for your part of the blog train (hit return a little too quick – sorry for the 2 posts). Thank you so much for this extraordinary kit! !